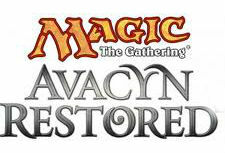 Today, Wizards of the Coast releases the third expansion in the Innistrad block, Avacyn Restored. Unlike most follow-up expansion, this set has 244 cards, about the size of an initial expansion. The main reason for this is probably since the initial 2 sets were about building up the evil side, they needed to balance things out. During the prerelease tournament, it seemed like most people were playing something based around the humans and angels. Blue and white were a common color pair that day. Along with the extra cards, new mechanics were added to this set. The first is the idea of miracles. Miracles are cards that can me case when drawn for a reduced mana cost. This means that you have to hope for them to come out at the right time, but some really powerful cards can come out for a lot cheaper cost. The second mechanic is Soulbond. This ability links 2 creature cards and as long as both stay in play, both creatures get an ability that is listed on the card with the Soulbond ability. This could be anything from simple things like lifelink and flying to more complex abilities that get spelled out. When linking 2 creatures both with Soulbond, this becomes increasingly useful. This looks like it will be a decent set with the addition of 2 new Planeswalkers as well. Given it will be around for a while with the Phyrexia set rotating out in 6 monthsa after M13, it’s interesting to think what type of decks will be coming up in the future.